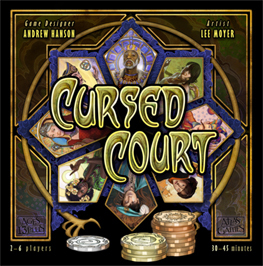 In Cursed Court players wager their limited influence across the courtly seasons. As the machinations of the nine key nobles are progressively revealed, their fortunes rise and fall. The intrigues of the realm's greater nobility are a subject of fixation, even obsession, for the minor nobles whose fortunes can be elevated - or shattered - by what happens at court. Players deduce what opponents know from the bets they place. With limited influence to protect your wagers, will you double an opponent's bid to bump their position, or stake a newer claim? How much can you afford to risk before knowing for certain how Winter will end? Custom chips represent precious but limited influence. Hidden information is shared by adjacent players. Riskier wagers offer greater rewards.